We offer a comprehensive selection of finely crafted wood and metal frames as well as a large variety of borders and mats to enhance your artwork. Our talented staff will help you choose styles, colors, and the correct measurements to ensure a beautiful result. Customize your artwork with any combination of frame and mat styles; the possibilities are endless. We’ll help you get exactly the look you desire. Our extensive collection of frame styles includes numerous colors, profiles, and finishes. Select from formal, carved wood, or something more rustic. Choose a sleek, modern design in a contemporary metal finish or a bold color. 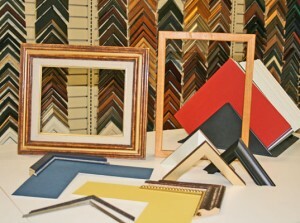 The right frame will complement your art’s motif, creating a distinctive look in any style you choose. Mats create an attractive transition between the image and its frame, giving your art a polished look. A traditional white mat will give artwork a professional museum-style appearance, while a colorful mat with a unique window opening (round, oval, notched, or any other shape) can give a piece a more contemporary effect. Choose from a multitude of colors and textures to give your finished piece just the right look. For your important art and heirlooms, conservation framing is a must. We use archival quality materials including acid free mats, core, and backing to preserve and protect your most precious artwork and photographs. Show company projects, corporate art, family photos, certificates, degrees, diplomas, or sports memorabilia with custom framing that will finish your project beautifully. We will assist you in choosing a design to reflect your personality and complement your décor. Create a unique display that’s all your own with our custom art framing and picture framing.